If you want to keep the toxins out of your body, I highly encourage you to try using as many homemade personal care items as possible. One such item is sugar scrub. It helps exfoliate and remove dead skin and your skin will look and feel better. Here are the best all natural homemade sugar scrub recipes. These recipes are fun, easy, and creative that you can make with simple ingredients. 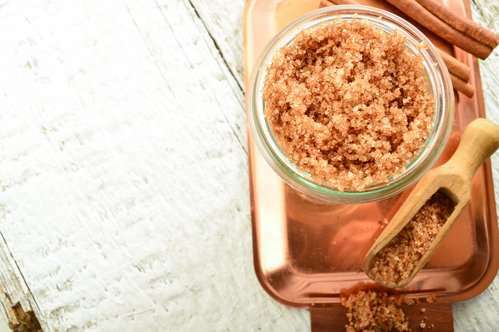 These top diy sugar scrubs are a great way to exfoliate, get rid of dead cells as well as rejuvenate your skin and provide natural glow to your skin. Sugar scrubs are easy beauty recipes with numerous possible variations. You can incorporate endless ingredients for your desired outcome, and they just take under ten minutes to make. You can use them on face, body, and particularly feet for silky and smooth skin. Moreover, they can be amazingly moisturizing and exfoliating to the skin. Excited? Stop; don’t rush to spa or departmental stores to buy those expensive sugar scrubs. Good news is they just cost pennies to make at home! And, if you are new to making your own beauty products at home – don’t worry. Today I am going to share with you the best DIY natural sugar scrub recipes. These top diy sugar scrubs are a great way to exfoliate, get rid of dead skin cells as well as rejuvenate and provide natural glow to your skin. (i) Mix all the ingredients and store in an airtight jar. (ii) When you want to use it, simply take out 1 tablespoon as needed in the shower. Scrub your skin with the mixture and rinse well. You will love your skin feeling like silk. Is it not so simple? (ii) Oil: 1 cup, use your favorite oil. Grape seed or avocado are good mild choices. You can use any other oil, but always choose good quality organic oil since some of it will remain on your skin. (iii) Essential oil: 3-4 drops; there are several oils with amazing scents and healing properties to choose from such as lavender, citrus (grapefruit, lemon, lime, orange), lemongrass, peppermint, ginger, etc. I encourage you to opt for high quality oil. Although it will cost more, but since you are leaving this on your skin – so don’t compromise! My favorite is lavender. (i) Mix well all the ingredients in a glass bowl. Stir them thoroughly. (ii) Store the concoction in a glass container because essential oils can react with metals and plastic, which can impair their properties. (iii) Take out a small amount of the scrub using a spoon. Rub it on your feet, hands and other parts of your body (wherever you want extra softness) for a couple of minutes. (iv) Let the scrub sit on your body parts for a couple of minutes and relax. (v) Rinse the scrub off and pat dry with a towel. This deliciously sweet scrub is a great way to gently slough off dead skin and provide a natural glow to your face. (i) Combine all the ingredients in a small glass bowl. Stir the mixture well until you get a scrub of uniform consistency. (ii) Rub the scrub very gently onto your face, neck, chest, hands and feet to remove the dry and dead skin cells. While working the scrub over your forehead, cheeks, chin and neck, rub with your fingers in small circular motion. Avoid scrubbing the skin around eye, as it’s very delicate in that region. (iii) Rinse the scrub off using lukewarm water followed with a splash of cool water to shrink the pores. Pat dry your skin with a clean towel. Try the above best sugar scrubs to transform your skin into smooth and silky. Let me know which combination you like the most under the comments section below.